So Richie Boucher, the CEO of Bank of Ireland, is on a salary and benefits package of over 800k. The BoI AGM is on today, and the Irish taxpayer owns 15% of BoI. The minister for finance has declined to vote to reduce this package (and that of the part time chairman…). At the same time the other minister for finance Brendan Howlin, has more or less decided to ignore the vote of public sector and will (despite having said he will get the labour relations commission to investigate how to ) impose or assume the pay cuts voted down. This entry was posted in Blogpost and tagged banks, economy, government, pay, politics, public sector on April 24, 2013 by brianmlucey. As a tax-payer i don’t care about the optics here. Vindictiveness will get us nowhere. What I want to know is what will happen if we take a specific action. If we cap his money and he leaves, will we get someone else who can do as good a job. I’m a public servant and my future, and that of my children, is more dependent on the state of the national economy than my personal income. Can the economists just tell us what will happen? Absolutely no one is indispensable. So, Rod, you’re pretty confident we can get someone as good but cheaper. Any names? I live your confidence. I wish I had it. I presume you are a professional banker. No But I’married to one. 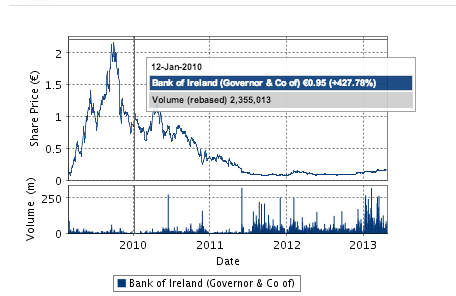 Bank of Ireland loses for 2011 2.2 bilion, Payments to Bond holders on behalf of Bank of Ireland this month 2.3 billion. What is the structure of Mr Boucher salary, i beleive if it was based on performance and target driven it might not reach the dizzy heights of 834.00o more like 83,400.